How do I view reports for an account? 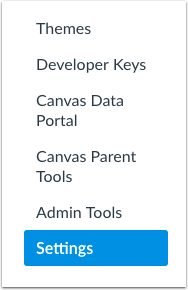 Account-level admins have access to Canvas reports that can be used to review account data. Canvas includes a set of default reports, though other customized reports may be included for your institution. 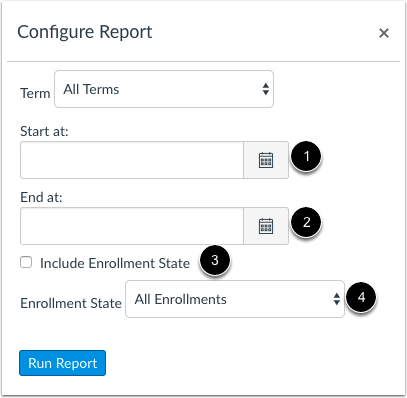 Learn about report configurations in the Canvas Default Account Reports PDF. The reports page shows all available reports. Each report includes the name  and a help icon  that explains more about the report. You can also view the last time the report was run, if any . Most reports must be configured before they can be run. 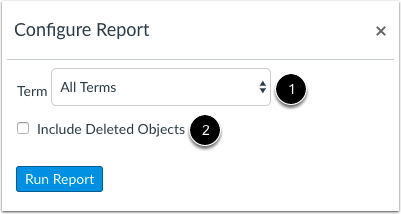 To configure a report, click the Configure button. Depending on the report, report configurations may include one or several options. All reports except the LTI Report, Outcome Export, and User Access Tokens reports require you to select a term. In the Terms drop-down menu , you can choose from the Default Term, or any active, future, or past terms. Courses with muted assignments may not accurately reflect scores in this report. 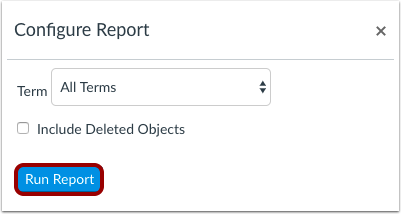 The Grade Export, Last User Access, Student Competency, LTI Report, and User Access Tokens reports include the option to include deleted objects. Deleted objects may include deleted courses, users, or enrollments. To include deleted objects, click the Include Deleted Objects checkbox . The Outcome Results report allows you to choose how to order the report. Ordering options are by Users, Courses, or Outcomes. By default, the report orders by Users. 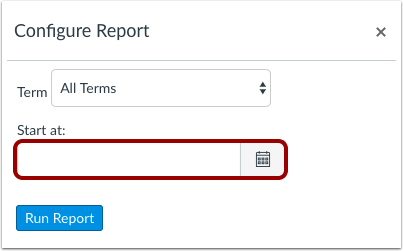 Select the radio button for your preferred report order. The Provisioning and SIS Export reports ask you to select the CSV files you want to generate for a selected term . Select the checkboxes next to the files you want to generate. 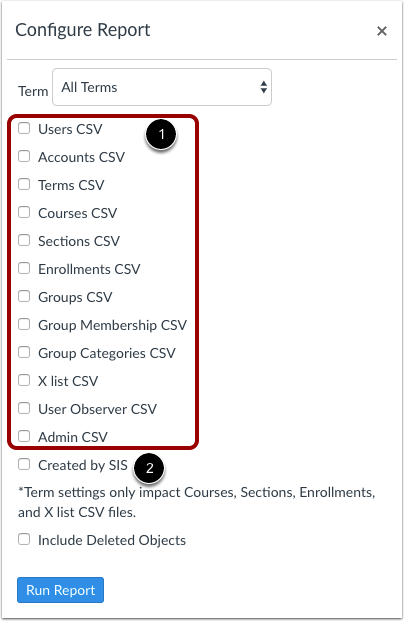 Files can be generated for Users, Accounts, Terms, Courses, Sections, Enrollments, Groups, Group memberships, Group categories, Cross-listing (X list), User Observers, and Admins. You can also choose to include deleted objects, which may include deleted courses, users, or enrollments. Viewing SIS data is optional in these reports. If you want to include data created by your SIS, select the Created by SIS checkbox . Otherwise, the CSV files only display data created through the Canvas interface. Note: The selected term only impacts Courses, Sections, Enrollments, and Cross-listing CSV files. The Students with no Submissions report asks you to select a start date  and end date  for the report. You can either select a date by clicking each respective date's calendar icon, or you can enter the date directly in the date field. You may also choose to include the enrollment state in the report by clicking the Include Enrollment State checkbox . In the Enrollment State drop-down menu , select all enrollments or only active enrollments. The Zero Activity report asks you to select a start date for the report. You can either select a date by clicking the calendar icon, or you can enter the date directly in the date field. 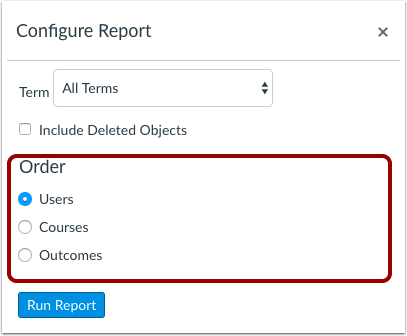 When you have finished configuring a report, click the Run Report button. When a report is complete and is available for download, click the Download icon. The file will download to your computer. 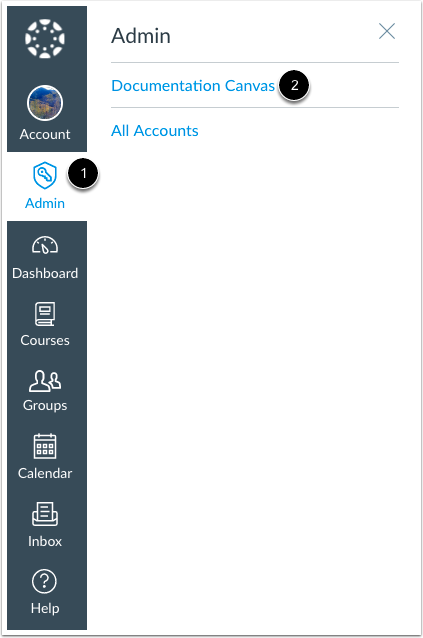 Previous Topic:How do I customize the Canvas Help Menu for an account? Next Topic:How do I manage new features for an account? Table of Contents > Settings > How do I view reports for an account? Re: How should I check a text file to see if it has a new course for my Canvas project?